I tweaked it a little to meet our needs, but we love this recipe. I made it with rice milk, so that it would be wheat, dairy, egg and nut free. It is delicious! This is delicious! I changed the almond milk to rice milk to suit our needs. My whole family loves it. Ok, if I hadn’t made this myself, I never would have known it was gluten-free! To be honest, most gluten-free recipes have a distinct taste or at least a different texture than non-gluten-free recipes. 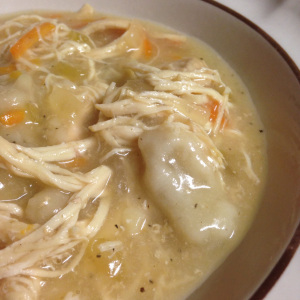 This by far is one of the best dishes of chicken and dumplings I have ever eaten! It is also dairy-free, so it did not leave me feeling so full and heavy like other chicken and dumpling dishes I’ve eaten. It is completely from scratch, but super easy. UPDATE: Due to several comments regarding the dumplings falling apart, I have added some changes to the recipe. Hope it helps!